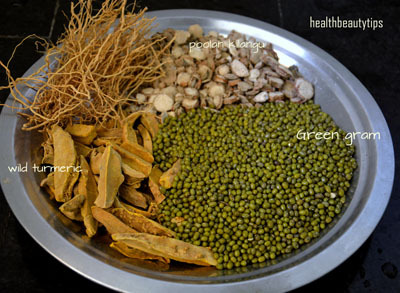 Making herbal oil at home is very easy and it is also very economical. This herbal oil promotes hair growth, prevents hair fall, conditions hair, prevents premature greying of hair and also cures dandruff. Mother Nature has gifted us innumerable herbs to take care of our hair and promote hair health. Let us see how to make herbal oil at home. Virgin Coconut oil – Light, natural and promotes hair health. Hibiscus and hibiscus flowers – Conditions, softens hair, promotes hair growth. Use ordinary red flower with single petals. Remove the style. Curry leaves – Helps hair growth and prevent premature greying of hair. Use the leaves alone. 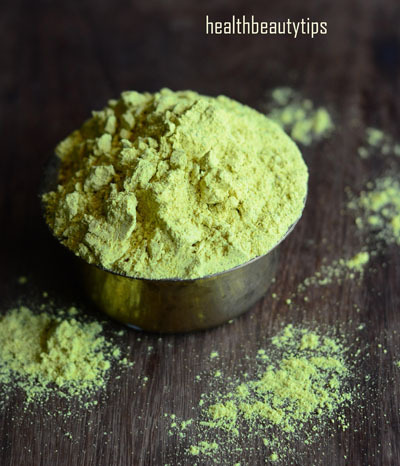 Karisalankanni – Promotes hair growth and cures dandruff. There are 2 varieties commonly available – one is with yellow flowers and another with white flowers. You can use any variety. Kilanelli leaves (Hindi name -hajarmani) – Help to get rid of dandruff and premature greying. Wash the herbs/leaves and spread it on a cloth inside the house to dry a little. Grind everything with very less water to a smooth paste along with hibiscus (shoe flower) flowers. Heat virgin cold pressed coconut oil, add the ground paste gently into the oil. It will start bubbling as seen in the picture below. Cook on low flame until all the water evaporates and the bubbling stops. Leave it to cool. After it cools completely, cover it and let it sit for 5-6 hours or overnight. Next Day – Line a sieve with a muslin cloth or a thin cotton cloth and strain the oil. Squeeze the cloth to extract as much oil as you can. Storage and Shelf Life – Store the lovely green herbal oil in a clean glass or plastic bottle at room temperature. Stays good for 5-6 months. Using your finger tips, apply the herbal oil on your scalp by parting your hair into sections. Cover the entire scalp. Massage gently for 4-5 minutes with your finger tips using circular movements to improve blood circulation. After 20 minutes, wash hair with homemade herbal shampoo or powder . It can be used daily in place of regular hair oil. It can be used as an overnight treatment . Apply it on your scalp, leave it overnight. Next morning wash your hair with any mild shampoo. Once in a week, you can apply this oil on the scalp, remain for half an hour and wash it off with a shampoo. This Herbal hair oil, when used regularly gets rid of dandruff, conditions dry dull hair, prevents split ends and cures many other hair related problems. Note – You will get these herbs in the local vegetable market or you can request your vendor who sells greens (keerai) to bring it for you. These herbs can also be easily grown at home. If you suffer from dandruff, clean your comb and change your pillow cover every time after washing your hair.